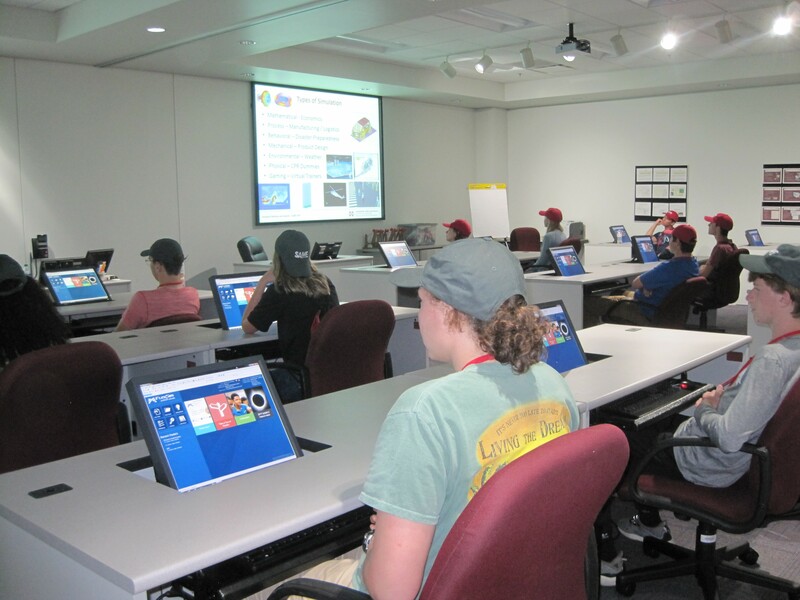 Forty high school students from across the U.S. participated in engineering workshops at the Center for Advanced Vehicular Systems-Extension in Canton, MS, as a part of a week-long SAME (Society of American Military Engineers) 2018 Engineering and Construction Camp provided through the U.S. Army Corps of Engineers. These camps expose incoming high school juniors and seniors with an interest in engineering to a unique curriculum and allow them to explore the field through projects and tours. Camps feature hands-on activities that are conducted in a competitive environment and promote teamwork, leadership, project management, and problem solving. Students engage in activities under the mentorship and supervision of SAME professionals. CAVS-E hosted the group of 40 students, along with 8 Pilots/Counselors and the Camp Director for half-day workshops as a part of the week-long camp held in June 2018. Workshops taught by experts from CAVS-E included demonstrations in Metrology Lab/3D Scanning Equipment and Computer Modeling using Flexsim 3D simulation software. During the Metrology Lab workshop, students performed hands-on measurements with tools used in a laboratory environment, such as height gauges, laser micrometers, force gauges, and optical comparators. The 3D measurement technology presented the use of measurement and scanning equipment used to control manufacturing processes. Highlighting the Computer Modeling workshop were demonstrations of key concepts used in simulation and modeling through Flexism, the most powerful tool for modeling, analyzing, visualizing, and optimizing various processes, from manufacturing to supply chains. Students were divided into teams of 10 to complete projects during the camp. Spirit awards were used to keep students engaged in projects and the team with the most points upon project completion was awarded prizes. One student from New Orleans, LA, stated that he had explored another field of study through camps held the previous summer only to discover that it was not something he genuinely wanted to do. He decided to utilize the SAME Camp to focus more on his STEM strengths this summer, and not only did he develop an interest, but was now highly considering a career in engineering. Another student from Vicksburg, MS, stated that she was positive she would major in engineering as her passion was to work on providing technological solutions and advances, but she was still unsure of the branch of engineering in which she wanted to specialize. One camp Pilot expressed his love for mentoring the students and supporting the project activities as he had previously participated in the camp himself and learned firsthand of the valuable opportunities of this experience. Following these workshops held at CAVS-E, students were given a tour of the Canton Nissan plant. As the demand for talented engineers continues to increase, STEM (Science, Technology, Engineering, and Math) education via summer camps teaches hard skills for future careers and fosters life skills such as problem-solving, creativity, and collaboration. CAVS-E, through a STEP (Student Technology Exchange Program) led by Victor Branch, Training, Education and Digital Manufacturing Tools Manager, engages students in STEM by embracing their existing knowledge, mindset, and skills to build a bridge to the world of work through a manufacturing, design, and engineering approach. Branch and CAVS-E have been working with SAME for over 10 years by providing workshops for their student groups. SAME unites public and private sector individuals and organizations to provide opportunities to its membership and to high school students who are interested in pursuing a degree in STEM for training, education, and professional development through workshops and networking events. These engineering camps have a good success rate, where 70-80% of participating students end up in a STEM-related field. 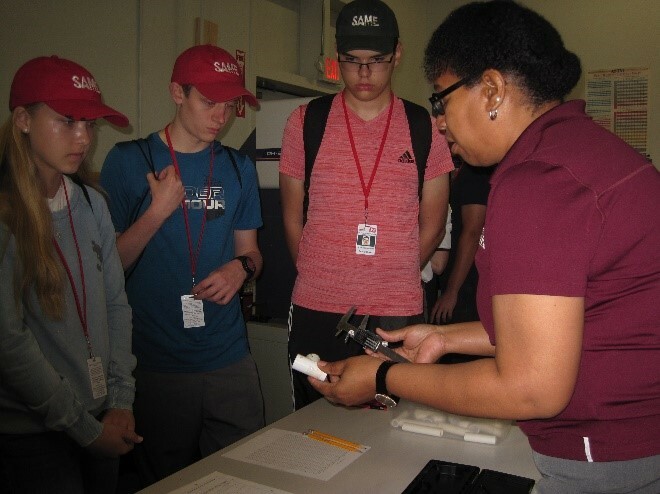 The 2018 SAME Engineering Camps were sponsored by U.S. Army Corps of Engineers, U.S. Marine Corps, U.S. Air Force Academy, U.S. Navy Seabees, U.S. Coast Guard, and the Exploring Engineering Academy.